I recently was inspired by this and this and this. 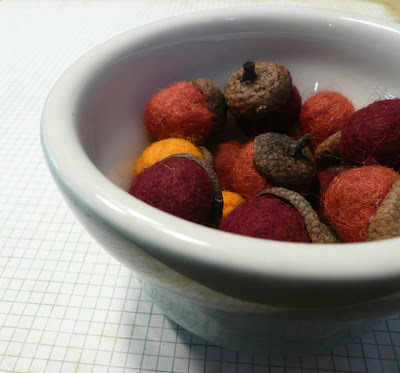 So I went out and collected some acorn tops that the squirrels had left behind after hiding their winter stash. 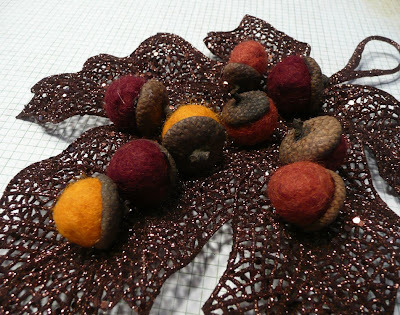 And last night I made a few acorns in pretty fall colors while watching Dancing With the Stars on TV. And then THIS happened. . . . . . The moral of this story is . 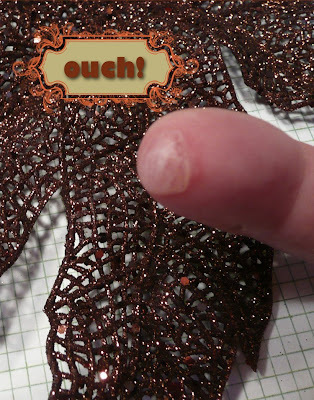 . . DO NOT try crafting things that require using a hot glue gun while watching television! Wow! These look so cute! Wow Dancing with the Stars must of been good...Your finger looks sooo painful! :( It was worth it they are charming!!! that is quite a blister Jeanne...the good thing is your acorns are delightful!!! He-heee. I can't operate a hot glue gun even when giving it my full attention. Love your felted goodies! Oh my I too have a nice Glue Gun blister! Ouch I feel for you dear friend! Ouch.. poor finger.. Those acorns are so pretty.. I have tons of oaks and caps like that on the ground.. I was wondeing what i could do with them.. Now i cant felt, i have no clue how.. but your imagination is great. Arent they sweet and fun to make? I made a bunch when I got back from the country living fair in Ohio after seeing them in the earth angels tent! I glass glittered the top part and made necklaces out of some. and I tied a few others around a new fall bear I made. nice booboo you got there.. I know how that feels! Your acorns are so cute, love them. I am sorry about your finger, I burned two fingers last night on a hot pan, it's awful. But I kept crafting, and putting ice on it. Hope it's better soon. Jeanne thanks for stopping in at my blog.. Hope you have a great day. Oh Jeanne that hurts! But I am addicted to Dancing with the Stars and would have a hard time using a glue gun and watching too! Cute acorns!!! Jeanne your acorns are lovely. I made some in white..I'll have to take a photo of them. Hope your finger heals soon! Yeah right I agree. Always be careful when you are using the hot glue gun. One mistake of using it will really hurt you. All That Glitters. . . . .